The Axiom Return Vehicle’s (ARV’s) first job is to drop off Eve and activate her for her mission on Earth. The ARV acts as the transport from the Axiom, landing on the surface of Earth to drop off Eve pods, then returning after an allotted time to retrieve the pods and return them to the Axiom. The ARV drops Eve at the landing site by Wall-E’s home, then pushes a series of buttons on her front chest. The buttons light up as they’re pushed, showing up blue just after the arm clicks them. At the end of the button sequence, Eve wakes up and immediately begins scanning the ground directly in front of her. She then continues scanning the environment, leaving the ARV to drop off more Eve Pods elsewhere. There’s an oddity in ARV’s use of such a crude input device to activate Eve. On first appearance, it seems like it’s a system that is able to provide a backup interface for a human user, allowing Eve to be activated by a person on the ground in the event of an AI failure, or a human-led research mission. But this seems awkward in use because Eve’s front contains no indication of what the buttons each do, or what sequence is required. A human user of the system would be required to memorize the proper sequence as a physical set of relationships. Without more visual cues, it would be incredibly easy for the person in that situation to push the wrong button to start with, then continue pushing wrong buttons without realizing it (unless they remembered what sound the first button was supposed to make, but then they have one /more/ piece of information to memorize. It just spirals out of control from there). What was originally for people is now best used by robots. So if it’s not for humans, what’s going on? Looking at it, the minimal interface has strong hints of originally being designed for legacy support: large physical buttons, coded interface, and tilted upward for a person standing above it. BNL shows a strong desire to design out people, but leave interactions (see The Gatekeeper). This style of button interface looks like a legacy control kept by BNL because by the time people weren’t needed in the system anymore, the automated technology had already been adapted for the same situation. Large hints to this come from the labels. Each label is an abstract symbol, with the keys grouped into two major areas (the radial selector on the top, and the line of large squares on the bottom). For highly trained technicians meant to interact only rarely with an Eve pod, these cryptic labels would either be memorized or referenced in a maintenance manual. For BNL, the problem would only appear after both the technicians and the manual are gone. It’s an interface that sticks around because it’s more expensive to completely redo a piece of technology than simply iterate it. Despite the information hurdles, the physical parts of this interface look usable. By angling the panel they make it easier to see the keypad from a standing position, and the keys are large enough to easily press without accidentally landing on the wrong one. The feedback is also excellent, with a physical depression, a tactile click, and a backlight that trails slightly to show the last key hit for confirmation. If I were redesigning this I would bring in the ability for a basic- or intermediate-skill technician to use this keypad quickly. An immediate win would be labeling the keys on the panel with their functions, or at least their position in the correct activation sequence. Small hints would make a big difference for a technician’s memory. To improve it even more, I would bring in the holographic technology BNL has shown elsewhere. With an overlay hologram, the pod itself could display real-time assistance, of the right sequence of keypresses for whatever function the technician needed. 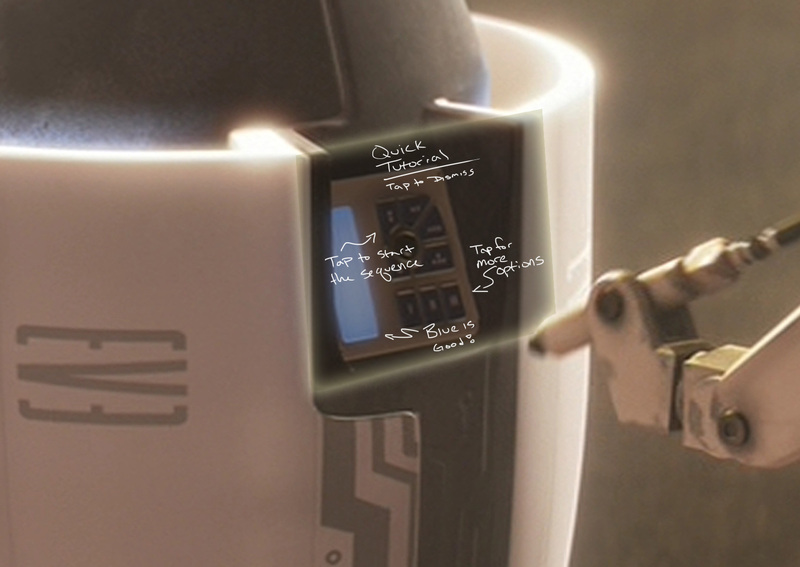 This small keypad continues to build on the movie’s themes of systems that evolve: Wall-E is still controllable and serviceable by a human, but Eve from the very start has probably never even seen a human being. BNL has automated science to make it easier on their customers. This entry was posted in WALL•E (2008) and tagged activation, affordance, analog, blue, button, Fitts' Law, glow, interface, robot, security, white. Bookmark the permalink.